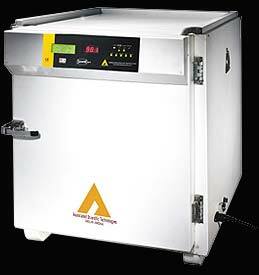 Celebrated for delivering nothing short of excellence to our customers, we present you Hot Air Sterilizer. It is used for various purpose in several industries. We strive to meet the international norms of quality set by the industry. Customers appreciated our assortment for its door-mounted controller, feather touch display with timer, automatic timer, open door display, automatic turn off heaters and indicators of Alarm and Heating, Auto-mode and sensor failure. Outside Chamber - Made of Mild steel/G.I. sheet duly painted (S.S. 304 optional). Ventilation - Provided on both side. Continuous display on L.C.D. of Set Temp., Attained Temp., Set Time, Heating On/Off. Display of door open (if door is not closed) & heater gets switched off automatically. (d) Digital temperature controller calibration certificate by test house traceable to NPL or NABL accredited Lab.